The purpose of this paper is to demonstrate that through rudimentary statistical analysis, that it is possible to gain access to secure systems by exploiting security vulnerabilities involving (HMAC) hashed passwords. The industry-standard method of storing user credentials (passwords) in databases is to use cryptographic one-way strings called hashes. A user’s password is hashed and stored in the database i.e. not plain-text. When the user goes to sign in again, the password is hashed and compared with the hashed password in the database. If the hashes match the user typed the correct password and if not, the incorrect password. Through exploiting vulnerabilities in the hash compare algorithm, it is possible to perform a “timing attack” and gain information about the system and through statistical analysis, gain access. String compares in most systems are implemented time-varying algorithm – compare byte by byte. A value which shares no bytes in common with the database hash will return immediately; a value which shares the first 15 bytes will return 15 compares later. That’s a difference of perhaps microseconds, but given enough attempts, the random noise becomes a very predictable, normally distributed skew, leaving only the signal. Thus, it is called a timing attack. This paper hopes to use statistical analysis to demonstrate and validate this exploit. In order to test for the vulnerability, I will implemented a simple test server using Ruby. It verifies an HMAC and sends back “yes” or “no” if the value is correct. I will then write a client that connects to the server and tries various values for the HMAC. It tries each value multiple times and records a set of time differences for each. These can be fed to a program for statistical analysis to decide when a significant difference has been confirmed (based on mean and standard deviation). Using the timing attack described above it is possible to spoof a valid HMAC, such as one from the above websites. I have also setup a client app that can query the web app. When the client sends a challenge to the server (logs in) it will compare that character-by-character with the server’s version. This of course leaks timing information. and recording the amount of time (milliseconds) each request takes to return. If we repeat this n amount of times (say 50) we can look at the mean or median time to see which character takes the longest to return. If the mean/median response time for ‘f000….0” is the largest, it can be deducted with degree of certainty that, ‘f’, is the first character of the HMAC. Then just repeat this process for each character, the next being “fX000….0”. Assume this turns out to be ‘5’, then repeat the process for “f5X000….0”. Until you have all 40 characters. Figure 1: Timing results (in seconds) for first pass of test – notice there is no large delta between the actual value ‘f’ and the rest of the sample. There seems to not be any apparent winner, all the results look very close. In other words there is a lot of noise hiding the signal. For this reason it is necessary to take multiple samples (scale the test) and use statistical tools to filter out the signal from the noise. We must scale the test by an arbitrary constant in order to separate the signal from the noise. I’ve found, through experimentation, that 500 is a good number. In other words: run the test in figure 1, 500 times, recording the results for each of the 500 trials. Below in figure 2 is an example of the response time distribution over 500 samples. The x axis is the first character of the hash 0 - F (in decimal) and the y axis is the response times in seconds. Each column in the scatterplot has 500 ‘x’.s You’ll notice the obvious shift up (slower response) time for the 15 (F) column. 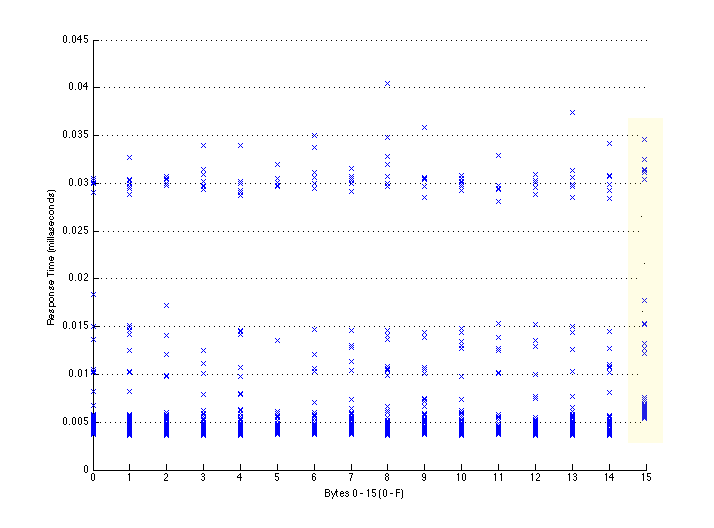 Figure 2: Shows the response times of 500 samples for each character 0-F representing the first character of the hash. Notice the highlighted portion has a significant shift up (slower response time). I would then take the average response time of each character which would determine the winner. This is the intuitive/obvious solution, however, sometimes this would not show a significant shift (as in figure 2) unless I ran it at very high scale constant. This method worked fine for the human eye because at some point the scale constant would produce the above shift but it is hard to automate. After all, the goal is to have my client app compute the whole hash automaticly character-by-character. In summary, this method was too deterministic and hard to automate .I found a better approach to filter the signal from the noise was a mean of means approach. Figure 3: 500 rankings for first character (only 25 samples shown). For example the character “0” was first ranked 7, 1, 3 then 3 again and so on 500 times. Figure 4: Average rankings of first character (smallest to largest order) smaller is better (winner). Notice the standard deviation of the samples besides “f”, the deviation is very small compared to that of “f”. This agrees w/ the timing information leak hypothesis. One of the responses took longer than the others. The others should be constant. it is also interesting to note that “f”’s average is so high and not closer to 0, b/c theoretically it should be 0 every time. This shows the importance of the distributed sampling, because there is obviously a large ammount noise in the samples. It is apparent from figure 2, that “f” is the first character of the hash since it’s average ranking is the highest. So, we repeat this algorithm for the remaining 39 characters. For each character of the hash (out of 40) we take the rank (1 out of 16) where 1 is the slowest. Then for each character ranks (500) we take the average and rank those. This scheme is a mean of the means. This is one statistical technique that allows us to filter the signal from the noise. So: 16 * 500 * 40 = 320,000 requests as opposed to a brute force technique that would cost 16^40 requests. Figure 5: A tree structure 40 levels deep representing the total possible HMACs. If we, for example, take the first branch that eliminates 15^40-n branches leaving 16^39 other HMACs, then 16^38 and so on until you have 16 and the final hash. Now, with my statistical and testing framework established, I set out to prove my hypothesis correct. I have my test server with a private hash set up and a client app to compute the hash statistically character-by-character and to send the challenge to the server. Program exited with code #0 after 534.90 seconds. Figure 6: Actual log output. First column is execution time in seconds. Second column is the character of the hash we are solving, the third column is the answer found and the last column is the computed hash so far. It took about 8.9 minutes to spoof the 40 character hash on my server. Each character took about 7 seconds statistically deduce – roughly linear growth. Imagine the implications here! Take for example blackboard or the ing Direct Bank with it’s similar 40 char HMAC. If I were to set loose this script on blackboard or the bank, within 9-20 minutes (taking into account more network overhead/jitter), I would be able to login as the student/client who was assigned the numerically smallest HMAC hash value – as my algorithm starts from 0 and increments up to FFFFFFFFFFFFFFFFFFFFFFFFFFFFFFFFFFFFFFFF. A simple brute force attack would take requests and even on a local connection that would take seconds, or longer than the known age of the universe! Using statistical analysis we are able to reduce the possible combinations by an order of magnitude () for every character index n, and spoof the hash in linear time. There are only a few ways to prevent this exploit and for the large part is ignored by mainstream sites as evidenced by the list of HMACs I provide at the beginning of this article. One solution, however, used by the largest sites on the internet is ‘rate-limiting’. If one client makes too many connections past a threshold the client will be banned for a period. This would render this timing-attack exploit useless. Rate limiting is employed by Google, Facebook, Twitter and a few other internet giants. Another solution is to use a compare algorithm that doesn’t leak timing information in the first place. The ruby languages build-in String compare algorithm doesn’t short-circuit when a match isn’t found and thus doesn’t leak, unlike python or java. In summary, replace time-variant compare algorithms with constant time algorithms. This vulnerability is well documented and easily remedied but for some reason is largely ignored. You may be wondering why, technically, does the web server leak this information. The reason for this time shift phenomenon is that, as described above, the code leaks timing information by “short-circuiting” when a match does not occur. In other words if byte 5 in a 10 byte array doesn’t match it returns 5 compares later. Or if byte 8 does not match it returns 8 compares later, each with a small time delta.